The Zoom technology of the shoe works, and a great number of users love the responsiveness they experience with the Nike PG1. A good number of customers mention that the multidirectional outsole pattern is the strongest attribute of these Nike PG shoes. Several reviewers agree that these Nike basketball shoes need a little time to break in. The ventilation provided by the mesh upper is praised by a lot of buyers. Many buyers appreciate these Paul George shoes because it is affordable and provides decent cushioning through its Phylon midsole. Some owners exclaim that since the shoe has a one-bootie construction, Nike is wise to use on the rear area a durable material that does not stretch easily over time. The shoe’s simple low-cut design and its forefoot strap wow a great number of purchasers. They agree that the Nike PG1 looks good on and off court. Some wearers mention that the forefoot strap provides additional lockdown for those who play aggressively on court. The Jordan CP3.11 can prove that as well. A lot of buyers pick up the signature shoe because it performs well for $110. A handful of testers mention that these Nike sneakers run narrow and wide-footers may need to go up half a size. The Nike KD 11 has the same issue. A number of shoe owners claim that their pinky toes keep hitting the toe box, causing great discomfort. If only Nike used full-length Zoom even in exchange for a few more dollars, these low-top basketball shoes would have been perfect, say plenty of buyers. According to some reviewers, these Paul George basketball shoes are not for explosive or big players who do plenty of rebounds or hard landings because the Zoom bags in them are not large enough to absorb such amounts of impact. Although it’s considered a budget shoe at $110, the PG1 is one of the best performing Nike shoes in 2017. The company definitely did not produce a gimmicky shoe model. The impact protection that it provides might not be as high as the more expensive models, but this shoe still deserves to have a spot in the rotation of most athletes. The containment provided by the internal heel counter is definitely to die for. The shoe conforms to the foot well. Simply, this shoe just gets the job done. If you are looking to cop an affordable new pair of basketball sneakers, the Nike PG1 is just right. It performs like a superstar without breaking the bank. Selling a signature model that features the iconic Nike Swoosh at $110 is about as close to a sure thing as you can get, sales wise. The Nike PG1 surprised me. I’m not the perfect player for the shoe since I do prefer more cushion with softer materials but I can surely see it’s a great option for those who want awesome response, stability, outdoor capabilities and lots of support. Comfortable but tight, solid traction, solid low profile cushion, killer support and a great upper. The PG1 marks the start of a line signature Nike basketball shoes for Paul George. The inspiration of the shoe comes from his favorite basketball sneaker, the Nike Zoom Crusader. The forefoot strap is George’s idea, and it is held in place by Flywire. There is a sizable piece of Zoom technology installed in the midfoot area of the outsole. Cushion. Cushioning is provided by the Zoom technology and the phylon that surrounds it. The Zoom bag is purposely designed to make protrusions on the outsole rubber. According to most reviewers, the PG1 benefits the athlete by providing a good amount of responsiveness and absorbing minimal impact in the forefoot area. The Nike PG1 is designed for athletes who use their forefoot a lot when playing. The preferred positions would be the guards or small forwards. The shoe has a low-to-the-ground feel without sacrificing the capacity to support the quick multidirectional footwork of the wearer. Traction. Depending on the colorway, the outsole can either be a solid or translucent rubber. Most reviewers prefer the solid outsole because it is less slippery compared to the translucent one. The purpose of the translucent outsole is to showcase the Zoom technology in the midfoot area of the shoe. The outsole has a multidirectional traction pattern. It is reported that being without flex grooves, this kind of traction works on clean courts. On dusty courts, wiping from time to time will have to be done. Length and Width. The Nike PG1 is created to have a standard length and width and be true to size. However, a handful of reviewers mention that the shoe runs narrow especially in the midfoot area. Users with wide feet might have an issue in the area where the strap is. It is recommended for new buyers to go up half a size or look for something else. Lockdown. The Nike PG1 is designed to fit like a glove. If the one-bootie construction of the shoe is not enough, the shoelaces with four lace loops can be tied to provide a more secure hold on the foot. The strap in the midfoot area is a bonus for people with quite narrow or slim feet. The tightness of the strap can be adjusted to more securely hold the midfoot down. The strap is further aided by a Flywire setup in the midfoot area. Flywire acts like a suspension bridge in offering support to the shoe. It is composed of lightweight and minimalistic filaments that are attached to the outsole. These filaments hug and secure the foot painlessly. The materials used on the forefoot of the Nike PG1 is a seamless combination of fuse overlays and mesh. The mesh provides breathability and comfort to the foot. The fuse overlays protect the mesh from tearing easily. The type of material used on the rear panel depends on the colorway. For the Black Ice colorway, the rear is made of nubuck. Nubuck is a fine grain leather from cattle. The outer side of the skin is sanded to produce a napped surface. The insole of the shoe is made of thick ortholite foam. Ortholite is a breathable and eco-friendly cushion used on most shoes. The rubber peaks on the midsole area of the shoe are designed to make sure the feet will be stable on the foot bed. It helps avoid injuries from ankle roll overs. The Nike PG1 has a low-top one-piece construction. The heel counter has a dainty pull tab with George’s jersey number 13 on it. On the lateral side of the shoe is a NIKE ZOOM callout, while the prestigious Nike Swoosh is on both sides of the shoe. On both medial sides of the shoe are significant dates for Paul George. On the left shoe, 5-1-15 is embossed to honor his daughter’s birthday. On the right shoe, 5-2-90 is embossed to represent his birthday. To make it known as a signature shoe, Paul George’s logo is placed on the tongue and on the outsole. The removable ortholite insole has his signature. Like the PG 3, the first signature Paul George basketball shoes are also released in a number of storied colorways that help in keeping the market engaged and interested. The subsections below discuss some of these special renditions. The Duke Blue Devils kicked off the NCAA season with their Nike PG 1 Player Exclusives, which comes in both home and away color schemes. The Home rendition is a white pair with blue and black accents and a solid outsole rubber. The Away one comes as a black pair with a speckled midsole and a translucent rubber outsole. The Nike PG 1 Baseline takes inspiration from the Oklahoma City Thunder where Paul George plays. An “OKC” callout and his “PG-13” monicker are seen on the lateral side of the shoe. He got this monicker when he changed numbers from 24 to 13 while still playing for the Indiana Pacers. As early as July-August 2014, there were already reports that Paul George changed his number. Everything was confirmed when he first jersey 13 in April 2015, in his first game after recovering from his infamous August 2014 Team USA scrimmage injury. The colorway features a variety of gray shades with detailed graphics on the rear panels. The shoe’s look is finished off with a black Nike Swoosh and a gum rubber outsole. Although it is not officially a part of the Nike Basketball 2018 Black History Month Collection, the PG 1 still pays tribute to people of color. The PG1 BHM rendition is a white pair with a red-and-black-speckled white midsole and a translucent outsole rubber. The forefoot features green, black, and red straps. The colors symbolize Africa’s rich vegetation, the people of color, and the blood shed for their redemption. On the rear panel, “11.01.2008” is ascribed. It is the date when Barack Obama was elected President of the United States. The Nike PG 1 Black/University Gold is inspired by the colors of the Indiana Pacers. The shoe comes with black suede upper. It has gold accents, a speckled grey midsole, and a black outsole rubber. This entirely blue pair was worn by Paul George in a victorious game against the San Antonio Spurs. The shoe comes with orange accents, a speckled midsole, and a translucent rubber outsole. The Nike PG 1 Checkmate comes with a predominantly white upper, black PG logo and Swoosh, and a translucent rubber outsole. This combination is inspired by the wise on-court mentality of Paul George. The Nike PG 1 Elements comes with an olive green upper, which reminds fans of the brand’s numerous Undefeated collaborations. This special rendition features a combination of mesh and suede, a speckled midsole, and black solid outsole rubber. In celebration of the annual Elite Youth Basketball League, the Nike PG 1 EYBL comes out with a colorful tongue, ankle collar, and inner shoe linings. This low-top shoe is predominantly black with a speckled midsole and a glow-in-the-dark translucent rubber outsole. The Ferocity colorway features a color scheme that is similar to that of the Indiana Pacers. The shoe has a blue upper, a white Swoosh and midsole, and a gray rubber outsole. Hints of gold are found on the PG logo and parts of the Velcro Strap. The Nike PG1 Flip the Switch is a part of the Nike Basketball Flip the Switch Collection. The shoe’s black upper is highlighted with a hyper violet Velcro strap, a broken blue Swoosh, and a midsole with a blue and purple ombre. The Nike PG 1 Floral Print is one of the products of NIKEiD. The shopper may choose between black or cream uppers, gold or metallic Swoosh, plain or speckled midsoles, and translucent or gum rubber outsoles. Paul George was seen working out in the Gladiator colorway of the first Nike PGs. The PG logo is rendered as a gladiator-like shield on the tongue. The Swoosh and the midsoles have faux cracks for aesthetics. Paul George rocked the grey suede player exclusive in a game against the Golden State Warriors. The shoe comes with a predominantly grey upper, a blue rubber outsole, a yellow pull tab, and a gradient Nike Swoosh. Featuring a combination of white, deep red, and gold; the Nike PG 1 Hickory PE was worn by Paul George to match the jersey colors of the Indiana Pacers’ Hickory uniforms. The Nike PG 1 Home Player Exclusive comes as a clean and crisp white pair with speckled midsoles and black and yellow Swoosh and PG logos. Nike PG 1 Ivory is a lifestyle shoe designed to have a combination of ivory, oatmeal, and light brown on its upper. The midfoot and side panels have a snake-skin texture with Swoosh logos made of suede. The light blue tip of the Velcro strap contrasts the earthy color scheme of the shoe. 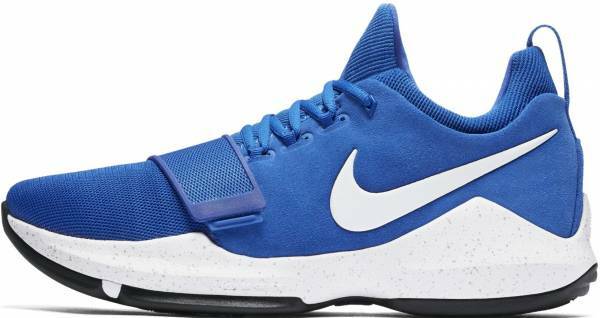 The Kentucky Wildcats is honored with a Nike PG 1 exclusive. This special rendition is bathed in a combination of blue and white. It has a solid rubber outsole. The Nike PG 1 Midnight in OKC was worn by Paul George in a match against the Dallas Mavericks. This version has a deep navy suede upper with orange and yellow detailing, a speckled midsole, and a translucent rubber outsole. The Nike PG 1 takes part in the observance of MLK day. As part of the Nike Basketball MLK Day Collection, these low-top basketball shoes come out as an entirely black pair. As the release date of the PG 2 is getting nearer, Paul George was seen rocking the Nike PG 1 in the OKC colorway. It is basically a white shoe that has bright blue, orange, and yellow accents. The Oklahoma State Cowboys is honored with a Nike PG 1 exclusive. It features a combination of orange and white that matches the colors of their team logo. Paul George rocked in the Opening Night Player Exclusive, which has an orange upper with a speckled midsole and yellow solid outsole rubber. On the occasion of Nike co-founder Phil Knight’s 80th birthday, Nike pays tribute to him by releasing an all-black rendition of the first Paul George shoes. It features a shiny Swoosh logo. Similar renditions of other Nike basketball shoes are also released. In reference to Paul George’s great love for fishing, the Pure Platinum version of the first Paul George shoes features a scale-like pure platinum upper. This version has a speckled midsole and a gum rubber outsole. The Connecticut Huskies dressed the Nike PG 1 in their white and blue jersey colors. Paying homage to his beloved country, the Nike PG 1 USA is dressed in blue, red, and white. The PG 1 takes inspiration from Paul George’s move to the Western Conference. It is rendered in a “Wild Wild West” version, which is actually a combination of tangerine tint and midnight navy that sits on a speckled midsole. It is reported that the Western Conference is loaded with NBA greats.